The data that the #BlackSpecFic Report is based on is in this spreadsheet. A couple of years ago, we1 noticed an alarming pattern in speculative fiction publications: while sometimes diverse in other ways, they published few to no stories by Black writers. 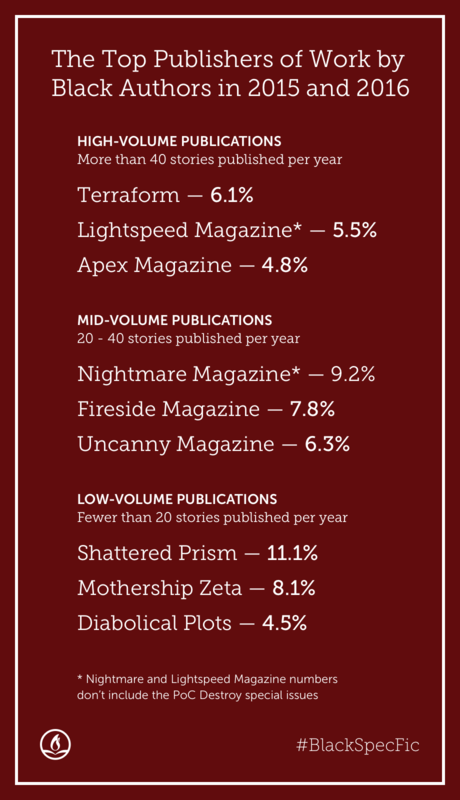 Our 2015 investigation of over 60 science fiction and fantasy magazines confirmed those perceptions. Only about 2% of the original stories2 we could find in the field were Black-authored. Given that people of the African diaspora make up about 13% of the U.S. population and a larger portion of the world population 3, the discrepancy disturbed us. And the math suggested that there was no possible way this lack of representation was random happenstance. A year after our initial report, many questions remain. To what extent is this problem due to submission and acceptance rates? And while it is almost assuredly both, how does the recursive4 nature between the two work? The sample and data points we have can’t fully answer those. There are questions for which numbers alone are inadequate to answer, and we think this is one of them. The data collected here seeks answers to other questions, the most important of which in our view is: within this structurally racist5 state of affairs, how are new writers faring? What happens when we take a deeper look at the field? We limited this analysis to science fiction, fantasy, and horror magazines that pay professional rates as defined by SFWA, have been in existence for at least two years, and are open to general submissions. 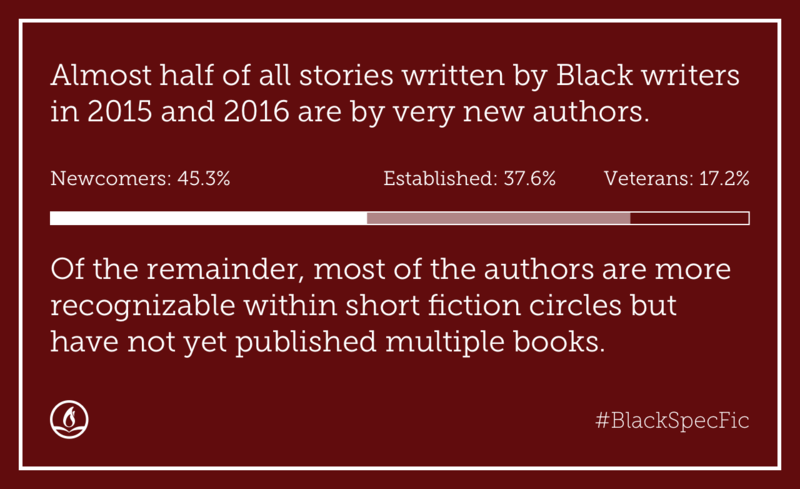 For both 2015 and 2016, we included additional data points: the number of unique writers, both Black and overall, and the number of stories by new Black authors. We are considering the field both with and without the “People of Colo(u)r Destroy!” special issues of Lightspeed, Nightmare, and Fantasy Magazine, since they constitute a project that is limited to one year. 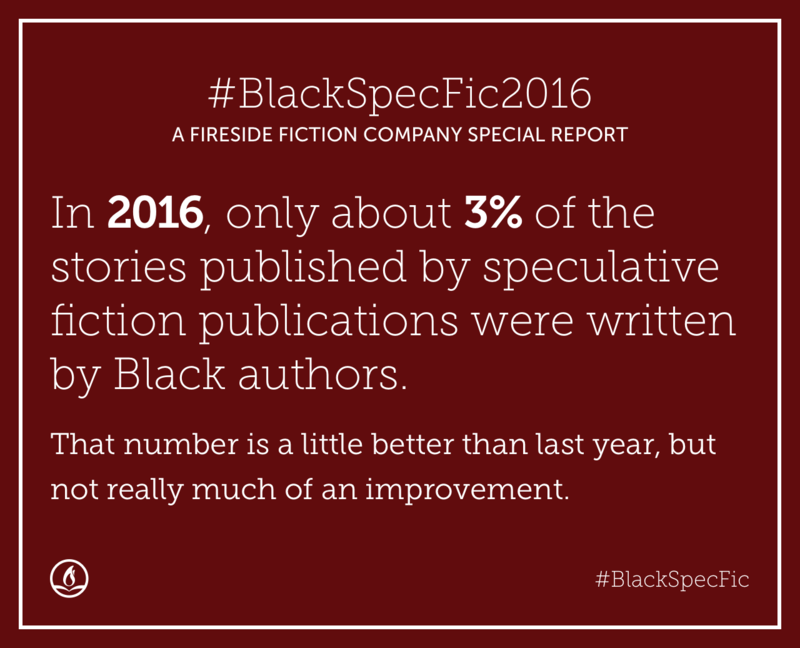 Without these issues, a sample of 24 professional SF/F/H magazines yielded 31 stories by Black authors out of 1,089 total stories — that’s 2.8% — while 2.9% of 2016’s published unique authors are Black. In 2015 we found figures of 1.9% and 2.4%, respectively. While there’s no way to determine yet if these small increases are evidence of gradual long-term improvement or just normal variation — two years is too short a trajectory for that — perhaps we can find a cautious degree of optimism. In our view, there’s a greater reason for hope. In spite of comprising a tiny portion8 of the field’s story volume, the “PoC Destroy” issues collectively contained over 20% of 2016’s stories by Black authors. They alone raise the 2016 field-wide ratio by nearly a full percentage point, from 2.8% to 3.6%. Put another way: any improvements that took place from 2015 to 2016? The “PoC Destroy” issues are responsible for about half. This is a major accomplishment of these issues’ editors. Speaking in a strictly quantitative sense, though, considering these issues’ scope9 and especially their size, a percentage increase of this magnitude should not have been possible, and would not be in a field that was healthy. This is not an argument for or against diversity-themed issues, a nuanced subject10, but rather a proportional look at what these illustrate about the whole: if such a small portion of the field can serve as a release valve for that much built-up pressure, the field is not functioning as it should. As a further example, the “PoC Destroy” issues appear to have more than doubled Afro-Caribbean representation11. While these figures indicate an existential problem for the field as a whole, some magazines are performing better than others. The bulk of stories by Black authors published in 2015 and 2016 were in large part published in the exact same magazines. About 65% of stories by Black authors. About 80% of unique Black authors (as opposed to less than 40% in the 15 magazines not pictured). About 75% of stories by new Black authors. In other words, according to every available metric, one-fourth of the field is publishing the vast majority of its Black work. There are disclaimers13 associated with the individual magazine data; however, the more information we collect, the more it points to a problem that can’t be explained by field-wide submission rates alone14. If it could be, why15 would the distribution be so uneven? Furthermore, if the magazines that aren’t portrayed in this graphic caught up to the ones that are16, the number of stories by Black authors in the field would theoretically more than triple. Black SF/F writers: we’d like to hear your comments and suggestions for how we can improve future reports. This also goes for data collection; we’re working purely from what’s publicly available on the Internet, and we don’t want to force people to publicly self-identify in order to be counted. If you suspect your stories are not included in this count and would like them to be, just want to double check, or have any other concerns — please let us know. Our email address is [email protected]; correspondence17 will be kept confidential. White stakeholders in this field: remember that, while we live in a world that tries to convince us differently, “fault” and “responsibility” look similar but are fundamentally different paradigms. This particular section of the report isn’t the source of many answers. For those, see both last year’s materials and upcoming ones: a roundtable with the staff of Fiyah Magazine and response essays by De Ana Jones, Chesya Burke, Maurice Broaddus, and Jennifer Marie Brissett, edited by Mikki Kendall. 1 — Author’s note: I use the first person plural throughout this article because many of its related decisions were derived via collective processes (though as their final arbiter, accountability for them rests on me). I decided, insofar as such is possible, to remove myself from the article — these numbers don’t need me to narrate the story they tell — and confine my presence to the footnotes. However, given that 2015’s report received more scrutiny than nuclear power safety codes are subject to, and because identifying one’s positioning is important in these sorts of matters anyway, a clarification: I do not have official affiliations with any short fiction magazine in the field. (Nor have I ever submitted to any.) The only financial relationship I have is payment for this article. I do have many personal relationships in the field (indeed, I am friendly with several of its editors, most of whom do not come off well here), which is how this report ended up at Fireside rather than elseweb. 5 — Structural racism: “the normalization and legitimization of an array of dynamics — historical, cultural, institutional, and interpersonal — that routinely advantage whites while producing cumulative and chronic adverse outcomes for people of color.” From Chronic Disparity: Strong and Pervasive Evidence of Racial Inequalities by Keith Lawrence and Terry Keleher. Further: “Structural racism is not something that a few people or institutions choose to practice. Instead it has been a feature of the… systems in which we all exist.” From the Aspen Institute. 7 — In order to see how the field is treating new authors, we had to use discrete categories with objective markers; this approach is somewhat flattening. Even within these groups, there’s wide variation; “new authors,” for example, are mostly recent debuts, but this category also includes an award-winner in multiple genres outside of SF/F/H and a film director, as well as a few authors who have published acclaimed novels with small presses or presses outside the U.S./U.K. (There’s also similar arbitrariness to the “established” categorization.) We wanted to make explicit the fact that this classification system is inherently reductive (as well as based on parameters that are ultimately American-derived), even as it indicates a sign of health outside the appalling lack of representation overall. 17 — Legitimate. Legitimate correspondence will be kept confidential. White tears and proffered cups from the Well of Actually may not be.